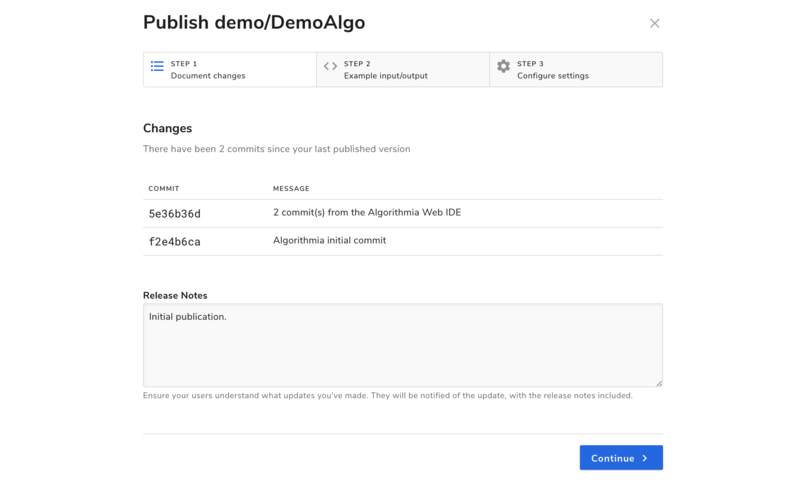 Welcome to Algorithmia! This guide is designed as an introduction to deploying your OpenCV model and publishing it as an algorithm, even if you’ve never used Algorithmia before! After training your OpenCV model, can save it as a .dat binary file. In this example we use the SVM.save() method. Because we’ll be saving the model to a data collection, let’s create that directory right now. Before we create our algorithm, let’s first train our model on our local machine on the handwriting digits dataset and save it to the DataAPI. This requires version 3.4.1.15 of opencv-python. The last line will save your model to the data collection you’ve created. Note: Make sure that your version of python is the same between your development environment and the algorithm. There may be version conflicts otherwise. Now is the time to set the dependencies your model relies on. Click on the “Dependencies” button at the top right of the UI and add opencv-python==3.4.1.15 under the required ones already listed and click “Save Dependencies” on the bottom right corner. Now, we’ll deploy our newly trained model. For testing the model we have, we’ll crop a single zero digit from the dataset for testing. Preloading your OpenCV model is a great step for improving your overall performance. By downloading your OpenCV model file when the container first starts, it means that any subsequent requests to the algorithm won’t have the same loading overhead! Before we can pass the image to the model, we need to pre-process the user provided image. The first function deskews the image, and the second function finds the HOG descriptor of the image. This guide is based on the OpenCV tutorial here.